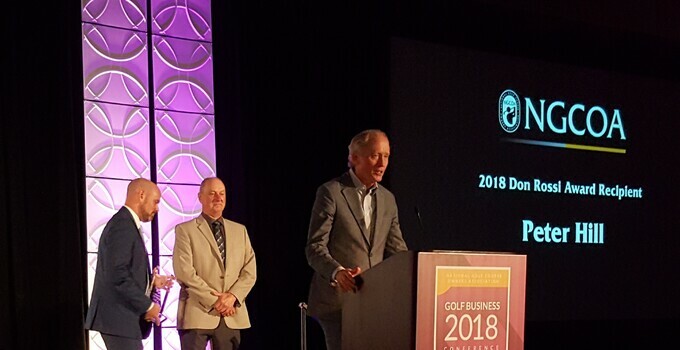 Peter Hill, CEO and Chairman of Billy Casper Golf (BCG), has been awarded the 2018 Don Rossi Award by the National Golf Course Owners Association (NGCOA). Annually, NGCOA honors its most outstanding members of the previous year. These individuals and organizations preserve the traditions of the game while embracing the challenges and opportunities of the golf business. Selection of the Don Rossi Award recipient is based on significant and long-lasting contributions to the NGCOA and industry as a whole. Hill has been on the NGCOA Board of Directors since 2011. Under Hill’s stewardship, BCG continues to evolve golf experiences through innovative programs like the annual World’s Largest Golf Outing, the national fundraiser conceived by Hill. His focus on data-driven marketing enabled by cutting-edge technology and invitation-based offers results in significant acquisition of new golfers and increased frequency of rounds from current players. The largest privately held management company in the United States, BCG owns or operates more than 150 properties in 29 states. Its new boutique division, Billy Casper Signature, specializes in country club, resort and private club management. Buffalo.Agency – BCG’s in-house, fully-integrated marketing firm – manages programs for BCG courses and more than 60 brands in the golf, sports and lifestyle sectors. Hill and other winners were recognized at the Celebration and Awards Dinner on Thursday, February 8, the final event of the Golf Business Conference at San Antonio’s Marriott Rivercenter. The annual Golf Business Conference provides attendees opportunities to connect and network with fellow course owners and operators, learn about new solutions and technologies, and leave with tools and strategies to grow their businesses. Information and registration is at golfbusinessconference.com. NGCOA is the leading authority on the business of golf course ownership and management. It represents and promotes the interests of golf courses as the principal businesses and economic assets of the game of golf. The not-for-profit organization is the only trade association dedicated exclusively to golf course owners and operators. Through advocacy, education and information resources, purchasing programs and networking opportunities, the NGCOA helps golf course owners and operators run more successful businesses. Billy Casper Golf is one of the largest privately-owned golf course management companies in the U.S., with more than 150 properties in 29 states. Headquartered in Reston, Va. – with regional offices across America – BCG has more than 25 years of results-driven expertise. The company specializes in full-service course management as well as assistance in specific segments of the golf business, including course and property maintenance, staffing and training, career growth, clubhouse operations, food and beverage, merchandising, golf instruction, marketing and public relations, special events and financial management.